Harris & Ewing, photographer. POTOMAC RIVER ICE JAMS. Washington D.C, 1918. Photograph. Retrieved from the Library of Congress, https://www.loc.gov/item/hec2008007434/. The Capital Weather Gang with the Washington Post, a favorite of mine, posted a neat article discussing the history of ice damming and ice floes in DC, specifically in the Georgetown area, as that is the area most susceptible due to the location of the old Aqueduct Bridge. Ice damming occurs when there is a long cold spell and large rivers freeze with a subsequent fast warming period. This causes the ice to quickly break up and flow down stream. If there is a bottleneck or obstruction , the ice will pile up and dam. Once those dams break, they unleash a torrent of fast-moving water laden with ice & debris which causes destruction down stream. 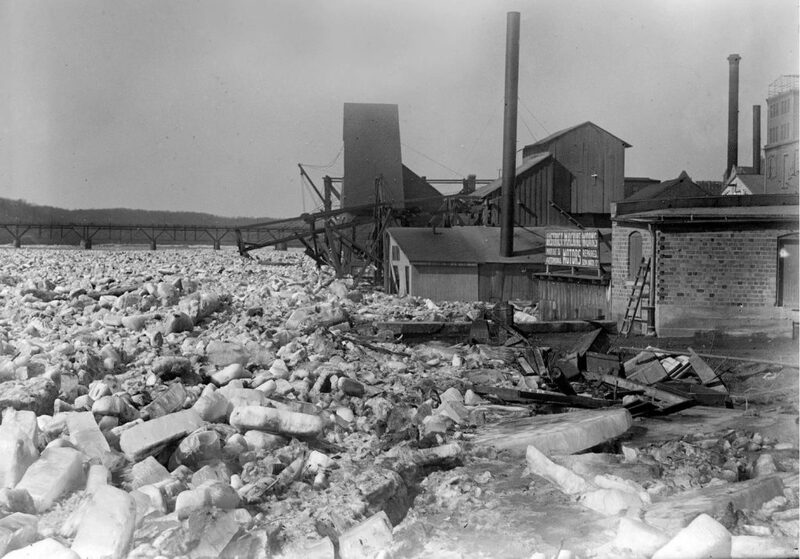 DC has had its fair share of ice dams and ice floes over the years, some worse than others. The 1918 incident was probably the worst in terms of destruction. Have a look for yourself. The WaPo article includes many great photos. Incidentally, here is a Google Maps view of the photo above!